IIn recognition of the three Tiffany Windows and four Spence Windows located in the Bloomsburg University library, the Andruss Library Special Collections contains over 40 books with a focus on the art of Louis Comfort Tiffany and Stained Glass Windows. NK5398.P56 O82 1997 "John Piper and Stained Glass," (1997) by June Osborne, a well known author and lecturer on stained glass from the University of Oxford Department for Continuing Education. Osborne is one of the first to teach regular classes on the topic of stained glass. In this book she explores how Piper, one of Britain's great artists, came to design stained glass and shows Pipers range of work. It includes over 100 illustrations from all over the world. •	NK5306 .A73 "Architectural Stained Glass," (1979) edited by Brian Clarke is a unique book that looks at stained glass as a constructivist, rather than medieval, art form, making it useful for architects. 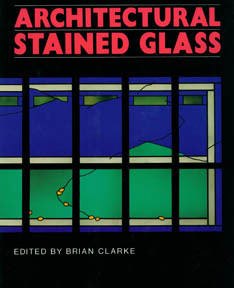 Contributors to the book included some of the world's foremost critics, artists, and scholars on the topic of stained glass. The second half of the book explores some of the most innovative architectural stained glass designs from the US, England, and Germany. •	NK5349.A1 K4613 1997 "The Narratives of Gothic Stained Glass," (1997) by Wolfgang Kemp. This book is the first study of stained glass from a narratological standpoint. At the time of publication Kemp was a professor of art history at the University of Hamburg and a scholar of medieval art. Most of this book was written during a guest professorship at Harvard University. The Tiffany Windows were purchased in 1920 to celebrate the 50th anniversary of the Bloomsburg State Normal School's first graduating class, and to honor the retirement of David J. Waller, Jr. 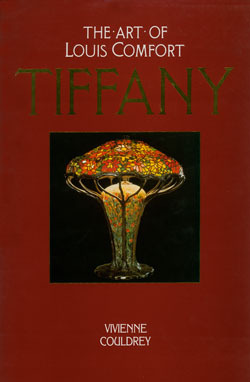 The collection also includes book about Tiffany's other various art forms. •	N6537.T5 F74 2006 "Louis Comfort Tiffany and Laurelton Hall: An Artist's Country Estate," (2006) by Alice Cooney Frelinghuysen takes the reader inside Laurelton Hall, Tiffany's estate in Oyster Bay, New York. Laurelton Hall, constructed between 1902 and 1905, is known to represent the height of Tiffany's artistic endeavors. Tiffany designed every aspect of the property including architecture, gardens, and interior decorations and accents. With over 350 illustrations this book accompanied the exhibit located in the Metropolitan Museum of Art. •	NK5198.T5 C68 1989 "The Art of Louis Comfort Tiffany," (1989) by Vivienne Couldrey explores Tiffany's different art forms and includes a chapter specifically on stained glass. Some of Tiffany's other art forms include lamps, vases, mosaics, jewelry, painting, interiors, metalwork and enamels. Tiffany is especially known for his use of color and work with glass. Couldrey was a novelist and short story writer and former editor of "Collectors World," she specifically writes about Art Nouveau. •	NK5398.T52 D86 1982 "Tiffany Windows: The indispensable book on Louis C. Tiffany's masterworks," (1980) by Alastair Duncan includes over 230 illustrations of Tiffany's stained glass windows. 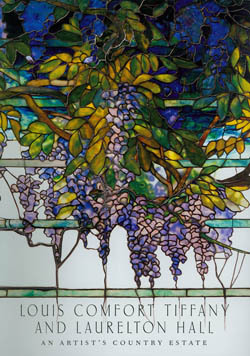 In addition this book provides text that examines how the glass was made and how the windows were constructed, his critics and international exhibitions, window themes, (including religious and historical figures, landscapes, and ornamental and abstract designs) a partial list of all known Tiffany windows (as of 1980), and much more. •	N6537.T5 A4 1981 "Art of Louis Comfort Tiffany," an exhibition organized by the Fine Arts Museums of San Francisco from the collection of the Charles Hosmer Morse Foundation from the M.H. de Young Memorial Museum, (April 25-August 8, 1981) by Donald L. Stover. •	N6537.T5 A4 2005 "Louis Comfort Tiffany: Artist for the Ages" (2005) by Marilynn A. Johnson; with essays by Michael John Burlingham, and contributions by Michele Kahn and Joan T. Rosasco.